This is one of the most well known quotes from the bible. When my sister got married last year I was honoured to read this at the ceremony. 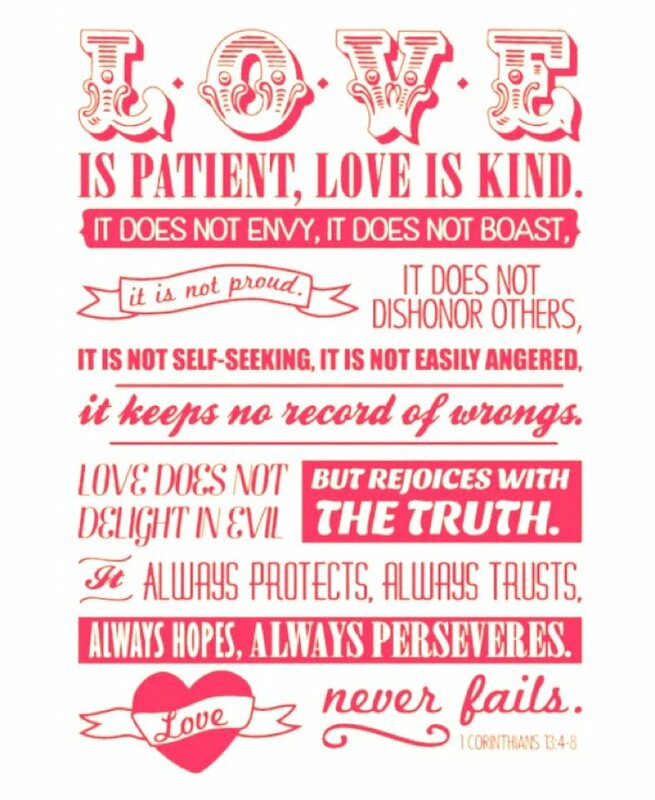 ‘Love is patient.’ this is so true. If you love someone then you will happily wait for them. Yes sometimes you need to just move on but real love waits until the time is right. ‘It does not envy, it does not boast.‘ People who are always going on about how much they love this person and that and has to tell everyone. That I think is boasting. Real love does not feel the need to do that. people who only talk about their relationships really annoy me. Even more then then people who ignore you because they have a man in their life. ‘It is not self-seeking.’ True. Real love finds you not the other way around. Don’t look for love. Love will find you one day. Some times you just have to wait a while to find that love. I have looked for love. I have looked in the wrong places. I have thought I had found it when in all honesty it wasn’t really love. I have come to realise love will find me when the time is right. Not when I want it but when the universe or whatever deems me ready for love as it is one of the strongest emotions around. ‘Love never fails’ True love is forever. No matter what. If love is there on both sides then t can never fail no matter what happens. What is love to you? What does it mean?